As I wrote earlier : ‘The two biblical scenes most commonly depicted in art come from the New Testament, from the Gospels of St Matthew and St Luke. They are The Nativity of Jesus (Matthew 1:18-25 and Luke 2: 1-7) and The Adoration of the Magi (Matthew 2:1-12). 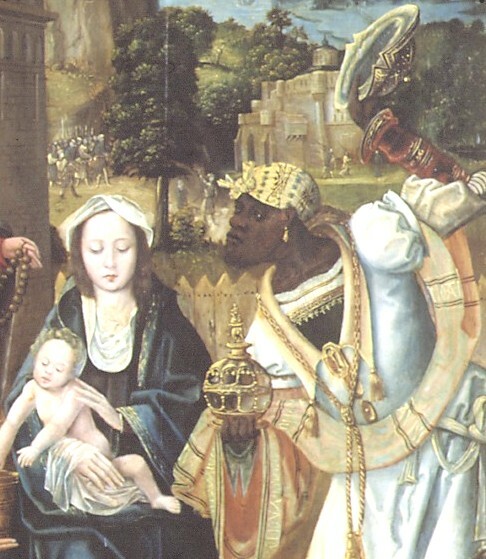 Although the Bible only speaks of magi, or wise men, who present Christ with gold, frankincense and myrrh, Christian literature and art transformed these three into kings, one of whom was subsequently represented as black. The arrival of these secular sovereigns bringing gifts to the Christ Child is regarded as an acknowledgement of Jesus’ task in the world. 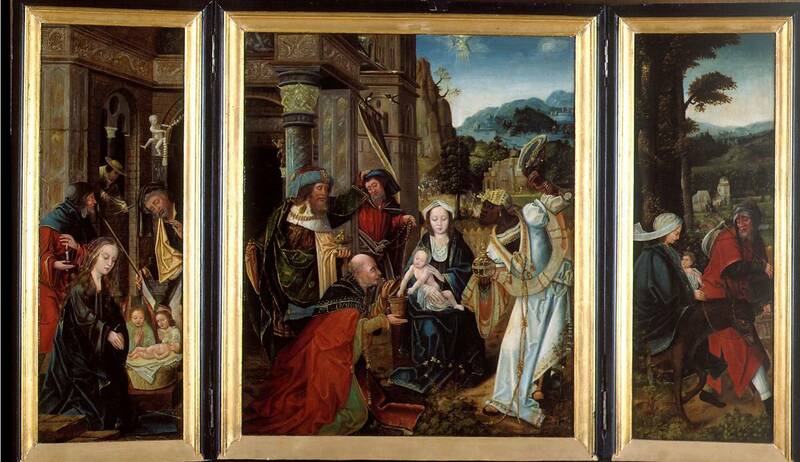 This Adoration is a magnificent example of Antwerp mannerism in the early sixteenth century. The artist has paid considerable attention to the sumptuous fabrics, extravagant clothing with long sleeves, contrasting colours, rich accessories and exotic headgear. The Black King has been accorded a prominent role, drawing all the attention with his striking, pale-blue clothing trimmed with gold and flamboyant pose. 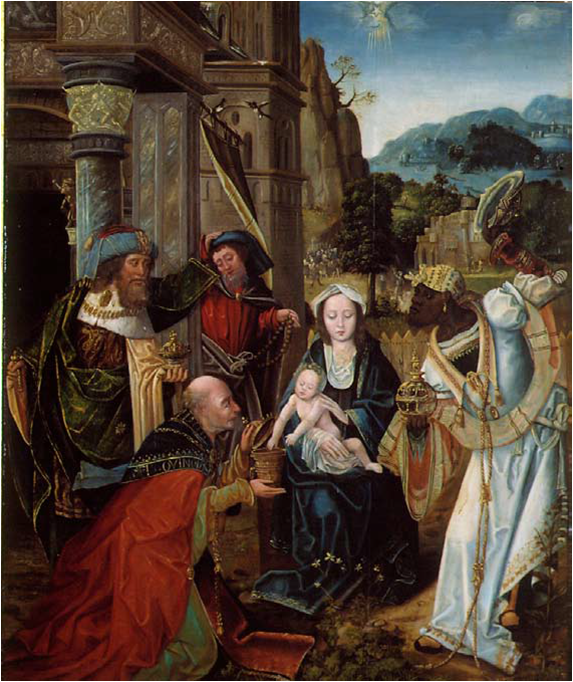 At the beginning of the sixteenth century the Adoration of the Magi became a popular subject in Antwerp for it offered an opportunity to represent wealth, with extravagant fashions and exotic figures. their children Caspar, Melchior and Balthazar. Antwerp merchants who traded with Africa appear to have had a preference for the name Balthazar. Antwerp had become the commercial hub of Europe and was growing rapidly. It was the chief centre for the transcontinental trade in costly fabrics, including silk, which feature prominently in Adorations from this period. (‘joyous entry’ or first ceremonial entrance into a town or city). On such occasions a sovereign would be presented with costly gifts in the form of beakers and goblets, to which the silver keys of the city, for unlocking its gates, were sometimes added. Research has been made possible thanks to a contribution of de Mondriaan foundation, AFK and VSB fonds.